A 54 year old man presented with multiple bone metastases and a mass involving the bladder neck. A TUR of the bladder was performed. 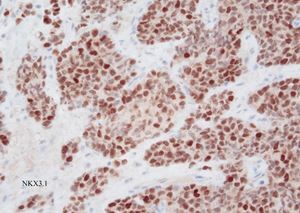 On outside stains, the tumor was negative for CD138, kappa and lambda light chains, CD56, CD45, CK7, HMWCK, AE1/3, desmin, and GATA3. Stains performed at our institution were positive for NKX3.1, P501S, PSA and negative for GATA3 and Uroplakin II. E-cadherin was lost in the tumor. Click on the below thumbnails to enlarge photos. What is the correct diagnosis? This tumor is identical morphologically to plasmacytoid urothelial carcinoma which can variably show cells resembling plasma cells, rhabdoid features, signet ring cells, and cells that have central nuclei similar in appearance to infiltrating lobular carcinoma of the breast. Plasmacytoid urothelial carcinoma shows loss of e-cadherin just like lobular carcinoma of the breast and infiltrates widely in the bladder like a signet ring cell adenocarcinoma. 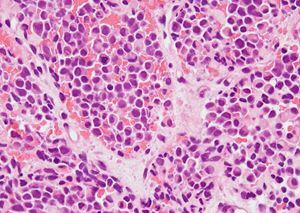 The vast majority of plasmacytoid urothelial carcinomas are GATA3 positive. 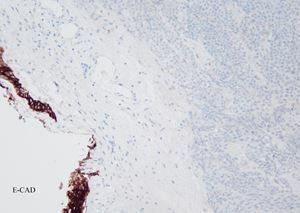 The negative stains for GATA3 in this case prompted additional stains which verified the lesion as being of prostatic origin. This case is unique as a plasmacytoid or rhabdoid variant of prostate adenocarcinoma has not been previously described in the literature and is not yet recognized officially as a distinct variant of prostatic adenocarcinoma in the WHO classification. 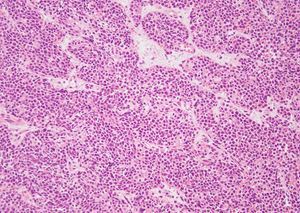 A pitfall with plasmacytoid urothelial carcinoma is that they label with CD138 which also stains plasma cells. Plasmacytoid urothelial carcinoma of the bladder is very aggressive with approximately one-half of patients dead in a few years and a tendency to recur in the peritoneum. The prognosis of similar tumors of prostatic origin is still undetermined, although they are likely to be associated with a poor prognosis given their poorly differentiated nature. The Genitourinary Pathology Society (GUPS) was formed with the vision of advancing the care of patients with urologic diseases through enhancements of best practices, research, and education in the subspecialty of Urological Pathology. GUPS is an official Companion Society of the United States and Canadian Academy of Pathology (USCAP).